Central Florida’s new commuter rail system, SunRail, recently opened for service with a celebratory Whistle Stop Tour that began at DeBary and ended at Orange County’s Sand Lake Road Heart of Pine Castle Station. Orange County Mayor Teresa Jacobs was the keynote speaker and host of the historic bell ringing ceremony commemorating the grand opening day. Mayor Jacobs was joined by District 3 Commissioner Pete Clarke, District 4 Commissioner Jennifer Thompson, District 5 Commissioner Ted Edwards, District 6 Commissioner Tiffany Moore Russell, elected officials and distinguished community leaders. SunRail will provide free rides through May 16 allowing commuters to experience the comfort and ease of traveling on SunRail while becoming familiar with schedules and ticketing systems. SunRail ambassadors will also be available at each station and on board trains to answer any questions that riders may have. Regular service for paying passengers begins on May 19. 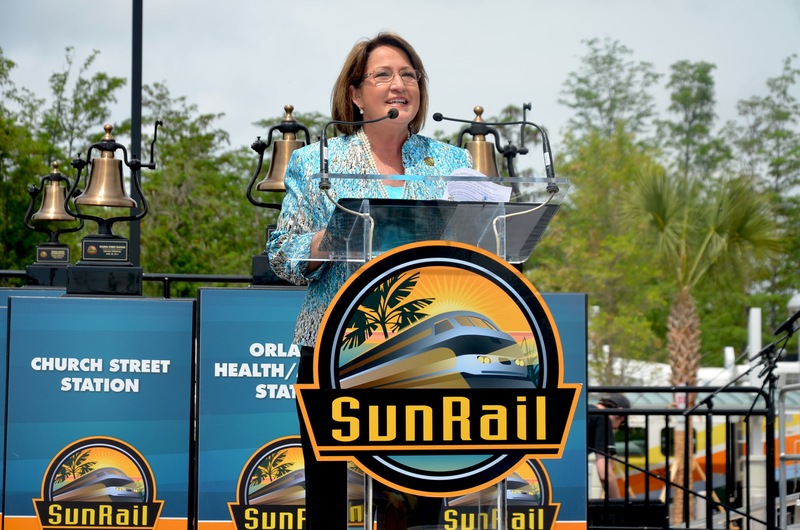 “SunRail’s opening signals an opportunity for us to address Orange County’s transportation needs as well as the potential for redevelopment along the route,” said Commissioner Clarke, whose district hosted the event. Commissioner Thompson echoed those sentiments. SunRail will connect DeLand in Volusia County to Poinciana in Osceola County when it is fully completed in 2016. Phase 1, which spans 32 miles and comprises 12 stations, connects DeBary with Sand Lake Road, near the Orlando International Airport. Phase 2 begins construction in summer 2014 and will extend the route north to DeLand and south into Poinciana. On its first day, SunRail provided service to approximately 10,000 Central Florida residents, many of whom used the commuter rail system to get to and from work during its opening week. For more information on SunRail, please visit www.sunrail.com.